These healthy snacks are great any time for a hit of energy. Add a tablespoon of rum to the mix to make them into a tasty after dinner treat. Add all the ingredients to a food processor. Process for about a minute until the mixture starts coming together. 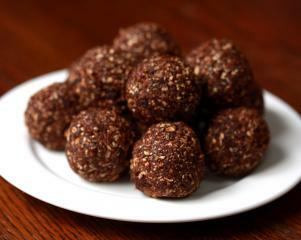 Roll spoonfuls of the mixture into cherry tomato sized balls and then store in the refrigerator or freezer to harden.